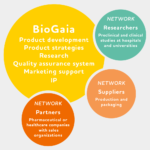 BioGaia’s business model is based on long-term relationships in three external networks – research, production and distribution. Thanks to this successful model, BioGaia has been able to grow globally with a small, efficient and agile organization. In the research there is collaboration with some 50 research institutes and clinics worldwide. Many of the researchers are among the foremost in their field. Some collaborations have been ongoing since BioGaia was founded, others are newer. At present some 55 studies are in progress around the world. The products are manufactured and packed in six different facilities in Sweden, Denmark, Belgium, Spain and the USA. Long-term and close collaboration with suppliers means that production and logistics are continually improved and can be adapted to market needs as well as new demands for sustainability. Suppliers – above all the wholly-owned subsidiary BioGaia Production – are also key partners in product development, both when creating new products and further developing existing ones. During 2017 BioGaia’s purchasing department started work on getting all producers and suppliers of cultures, raw materials and analysis services to sign up to the company’s Code of Conduct. At the end of 2018 all suppliers of production and packaging had signed up to the Code and among suppliers of analysis services 85 percent had signed or were in the process of doing so. The distribution network consists some 80 partners with sales in about 100 countries. Most of these distributors have sales representatives that visit doctors and other healthcare professionals. By providing information on the published results of clinical trials they build up interest and confidence among doctors who then recommend the products to their patients. In parallel with targeting healthcare professionals, the distributors ensure that the products are available in pharmacies, the main sales channel that healthcare professionals recommend to their patients. Some distributors have also worked for a long time with marketing direct to the consumer. This is something that a growing number of partners see as an important complement going forward, especially since sales to an increasing extent will take place through digital channels. However, the difference in maturity in different markets varies widely. Among the countries where BioGaia operates, the USA and China have made the greatest progress with digital marketing and e-commerce. In most markets BioGaia’s products are registered as dietary supplements. BioGaia’s regulatory specialists collaborate with the distributors’ experts to ensure compliance with local regulations. BioGaia has also developed a Code of Conduct for distribution partners and work on getting signatories started in 2018. Of the some 80 partners, almost 40 percent have signed the Code and the others are in the process of doing so. The aim is that all partners should be signatories by 2020. BioGaia’s Code of Conduct specifies minimum requirements and covers areas such as respect for human rights, work environment and workplace safety as well as environmental issues and business ethics/anti-corruption. To date, 203 clinical studies using BioGaia’s human strains of Lactobacillus reuteri have been performed on 17,300 individuals of all ages. BioGaia has a strong network of distribution partners around the globe. Most of the around 80 partners are pharmaceutical or other health companies. BioGaia’s products are sold in around 100 countries. The largest segment is paediatrics, accounting for over 80 per cent of total sales.